However, Muallem said even more during the first day of the Geneva II conference. In fact, he said a great deal more. 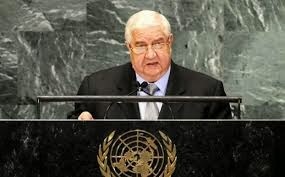 During the course of his speech to the assembled delegations, Muallem addressed the history of the foreign-backed terrorists operating inside Syria, the countries who have trained, financed, and supported these terrorists, and the unspeakable atrocities that they have committed over the last three years. Muallem expressed a desire to rid Syria of the death squads now continuing to operate within its borders as well as a determination to ensure that decisions about Syria’s government will be made by Syrians themselves. Yet the mainstream media outlets have largely ignored the publication of Muallem’s words to the delegation, instead focusing on two short sound bites and an article’s worth of disinformation in the interpretation of the statements. This then, is the “inflammatory rhetoric” that Western governments and media outlets, would rather you not hear. Indeed, this misery and destruction, wich has engulfed Syria, has been made possible by the decision of Erdogan’s government to invite and host these criminal terrorists before they entered into Syria. Clearly, oblivious to the fact that magic eventually turns on the magician, it is now beginning to taste the sour seed it has sown. For terrorism knows no religion, and is loyal only unto itself. Erdogan’s government has recklessly morphed from a zero problems with its neighbours policy to zero foreign policy and international diplomacy altogether, crucially leaving it with zero credibility. Nevertheless, it continued on the same atrocious path falsely believing that the dream of Sayyid Qutb and Mohammad Abdel Wahab before him was finally being realized. They wreaked havoc from Tunisia, to Libya, to Egypt and then to Syria, determined to achieve an illusion that only exists in their sick minds. Despite the fact that it has proven to be a failure, they nevertheless are still determined to pursue it. Logically speaking, this can only be described as stupidity, because if you don’t learn from history, you will lose sight of the present; and history tells us: if your neighbor’s house is on fire, it is impossible for you to remain safe. Ladies and gentlemen, the Syrian Arab Republic – people and state, has fulfilled its duties. It has welcomed hundreds of international journalists and facilitated their mobility, security and access; and they in turn have reflected the stark and horrific realities they witnessed to their audiences, realities that have perplexed many Western media organisations who couldn’t bear their propaganda and narrative being exposed and contradicted. The examples are too many to count. We allowed international aid and relief organizations into the country, but the clandestine agents of certain parties sitting here, obstructed them from reaching those in dire need of aid. They came under terrorist attack several times, whilst we, as a state, did our duty in protecting them and facilitating their work. We issued numerous amnesties and released thousands of prisoners, some even members of armed groups, at the anger and dismay of their victim’s families; these families though, like the rest of us, ultimately accepted that Syria’s interests come before anything else, and hence we must conceal our wounds and rise above hatred and rancor.